A fish fryer or cooker is a practical piece of equipment that both restaurants and household need. The market features many such products and choosing the best cooker is all about comparing the characteristics and determine which one will boost productivity and result in the creation of delicious meals. Looking for the best price to quality ratio will also enable you to acquire the fish fryer that will be the perfect addition to your kitchen. If you’re buying a fish cooker for the first time, you’ll need to acquaint yourself with some of the most important terms before getting started. The tank capacity is the first one. 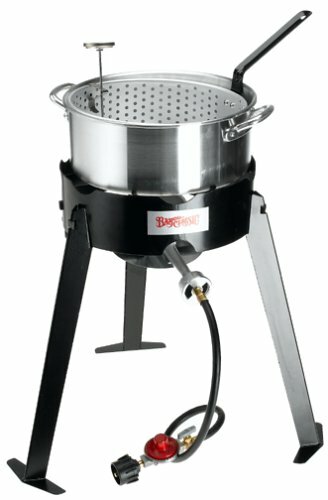 Most commercial fryers (as well as the ones designed for household use) are differentiated by the tank capacity. It refers to the amount of oil that the cooker can hold. Also, you’ll get specifications for the hourly output – the pounds of fish that can be cooked in the appliance in a 60-minute period. Usually, a 40-pound fryer can produce about 80 pounds of French fries or fried fish per hour. Choose the capacity that corresponds to your needs. Otherwise, you’ll end up producing too little or you’ll have a cooker that has a very high capacity you can’t utilise properly. The recovery time is a term that refers to the minutes needed for the oil to return to the ideal cooking temperature after the fish is submerged to it. The fish is cold before the cooking process starts, which means that it will “take away” from the temperature of the oil. If the recovery time is very long, the fish will become too greasy rather than crispy. Some other terms to look for include the number of baskets and the thermostat. The thermostat is the tool that allows you to control the temperature of the oil. Basic models only feature an on/off switch. They don’t allow better control over the fish cooking process, which can reduce the quality of the output. Regarding of the fish cooker variety that you’re interested in buying, it’s imperative to explore the ease of cleaning. Getting rid of the used oil can be a messy process and the best brands have features that simplify the process. The oil compartment drain is usually positioned in the lower part of the fish cooker. It should be easy to open and easy to empty. Some companies like Pitco have specialised accessories that simplify the emptying of the fryer. Hands down, stainless steel is the best material that fish cookers can be made of. Some of the products for home use come with plastic parts or a body that’s made of other metals. Stainless steel, however, is a lot more durable and it’s also easier to clean. Another nice feature that will make your life easier is a non-stick interior. Stainless steel baskets and non-stick interiors prevent the accumulation of cooked food inside. Even if some of the fish or the batter stick to the cooker, they will be much easier to clean. Depending on the amount of space available in the kitchen, you should look either for a countertop fish cooker model. Freestanding fryers will obviously require more space and they usually have a larger capacity. Such products are better-suited to the needs of mid-sized and larger restaurants. The countertop cooker saves space and it can be placed in even the tiniest kitchens. The final distinction you’ll have to make focuses on the power source. Some commercial fish cookers are gas-powered and others are electric. Compare gas and electricity rates for your city to determine which one will be cost-efficient. In the past, gas used to be a lot more affordable. Today, this isn’t necessarily the case. The market features both varieties so it’s up to you to choose the variety that will be more practical. Now that you know the most important characteristics, do a bit of research about different brands. Some companies have a better reputation due to many years of existence and strict adherence to industry standards. Going through customer reviews and testimonials will simplify the task tremendously. Just make sure that you’re going through authentic customer reviews rather than ads written by manufacturers or critical reviews created by competitors.